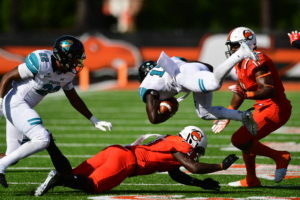 Buies Creek – Coastal Carolina scored seven unanswered touchdowns, topping Campbell 58-21 Wednesday afternoon at Barker-Lane Stadium. 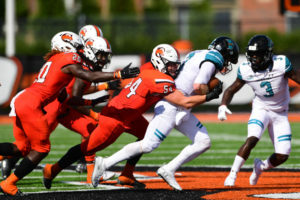 Wednesday’s game marked the first time a FBS program has visited a FCS foe in a true road game since Army traveled to Yale in 2014, and just the third time since 2008. 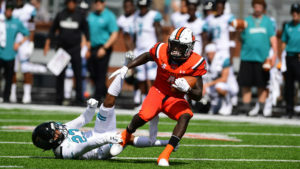 The matchup was originally slated for Saturday, September 15 in Conway, S.C., but was shifted up three days and to Buies Creek due to th impending threat of Hurricane Florence. Campbell found the end zone on its first three possessions to lead 21-10 after Rocky Reid punched in a one yard run, set up by Aaron Blockmon’s 38-yard grab from Daniel Smith.